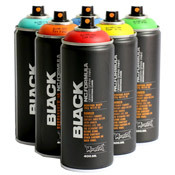 Perfect for painting on large, rough surfaces (like raw wood) with brands like Rustoleum and Painters Touch cans. 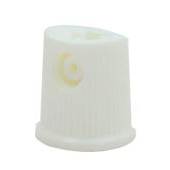 This cap blasts a wide, high volume stream that offers double the output of a stock cap. Explore new terrain with the High Volume Cap, as it is also perfect for irregular surfaces like, congregated metal or through a chain link fence. 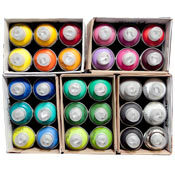 Also excellent for long distance spraying, this cap will paint a solid dot from as far as eighteen inches away with a width of approximately three inches. Nice cap for quick, solid fills on surfaces that absorb a lot of paint, like raw wood, brick and concrete. It's almost like a hybrid between a Blaster cap and an Extinguisher cap for male stemmed cans, but it won't flare like a Blaster cap would. As ArtPrimo already said in the description, it will hold pretty much the same sized line whether you hold the can 5 inches or 18 inches from the wall, which is really helpful if you're trying to reach high up. Of course it will empty your cans fast, but in return, it will give you solid fills on raw concrete in half the time it would take you with any other female cap, or a NY fat on an adapter. This product was added to our catalog on Thursday July 11, 2013.